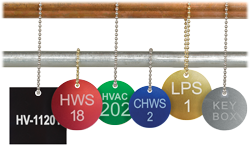 PipeMarker.com offers ready to ship valve tags, however, we understand that your order may need to be customized to your exact specifications. Using our easy to use customization tool, you can quickly design Custom Valve Tags for your needs. 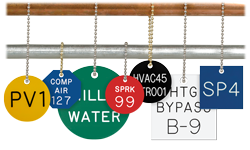 Choose from brass, aluminum, stainless steel, or plastic valve tags. From there, we offer a number of shapes, sizes, and marking techniques. If you'd like personal assistance contact customer service at 800-274-6271 or via online chat.